Puzzle games, just like every other genre, are sharing in the mobile gaming boom. Touchscreen controls are ideal for intuitive control of puzzle elements, and short, sharp mental challenges are perfect for gaming on the go. From abstract games and physics puzzles to murder mysteries and more, there are tons of puzzle games that you can enjoy anywhere. One of the best puzzle games on the Android platform is Petriq, a game that addicted all of our staff members. The developer team, SmartCat Games, managed to create a game that combines traditional connect 4 and physics game and presented all of that with great design, smooth user interface, cute characters and awesome soundtrack (the famous Two Finger Johnny by Kevin MacLeod). 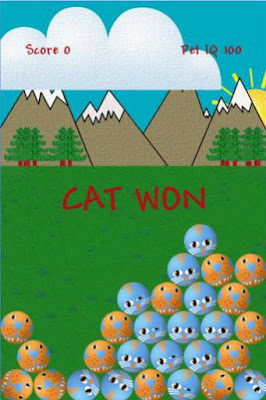 The goal of Petriq is simple – connect 4 cats or dogs in a line or in a row, vertically, diagonally or horizontally and win. You do that by tapping on your screen and leading the pets where you want them to fall. They won’t stop falling from the sky, so make sure you connect as many as you can and play as long as you can. Choose a difficulty level (a Pet IQ from 100 to 145) and see if you can beat the Smartest Cat. Click the link below for more information and download Petriq for free from the Google Play Store now.